Find relief fast with our sports injury therapy in Rancho Cucamonga CA. Whether you’re a professional athlete or a home gym aficionado, you may experience pain from time to time as a result of your exertions. In the case of a fall or a collision with another player, you may know exactly what caused your injury. But in other cases, the root cause of the injury may be something more subtle, such as an ugly tennis serve or an improper lifting technique. At Form & Function Physical Therapy, we help you discover and address the root cause of your pain. Whether you are suffering from a sprain, strain, fracture, dislocation, dysfunction, or inflammation, you can rely on our expert sports therapy in Rancho Cucamonga CA to provide a lasting solution. 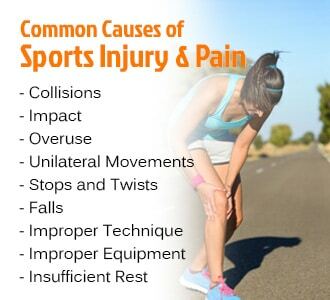 Collisions: In contact sports like football a collision with another player can cause a wide variety of injuries from twisted ankles to head injuries. Impact: Hard impacts can cause sports injuries like shin splints and planar fasciitis. The harder the surface you’re running and jumping on, the higher the risk of impact injuries to the feet, legs, hips, and back. Overuse: Repetitive movements are a very common cause of strain, inflammation, and pain. Overuse can also apply to cases where athletes work themselves too hard at a new motion or activity and end up straining their muscles. Unilateral Movements: Golfers and tennis players often suffer lower back pain because their sports require unilateral movements that only exercise half of the body. Stops and Twists: Sports like basketball or tennis that require frequent stops, starts, and changes of direction often result in damage to ankles, knees, and hips. Falls: Breaking a fall with a wrist is a common cause of sprains, ligament tears, or even fractures. Improper Technique: Going against the natural biomechanics of the body to perform an awkward or unnatural movement will eventually result in injury. Improper Equipment: Wearing shoes that don’t offer enough support is the most common equipment error made by runners and other athletes. Using a weight or racquet that is too heavy for your current strength level is also a common cause of sports injury. Insufficient Rest: The body heals best during sleep, so if you’re not getting enough sleep you may be experiencing lingering pain from injuries that should have healed already. No matter what kind of injury is causing your pain, Form & Function Physical Therapy can help. We provide physical therapy in Rancho Cucamonga CA to help unlock the natural healing ability of your own body, as well as cutting edge 830 Laser treatments to provide immediate relief from pain caused by inflammation. Call us today to set up your appointment.